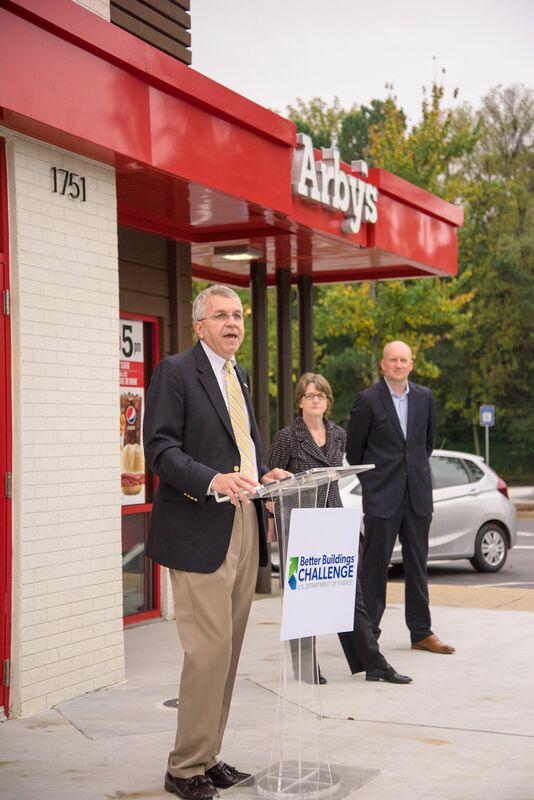 (APN) ATLANTA — On Thursday, October 29, 2015, the U.S. Department of Energy came to Atlanta to highlight energy efficiency, including a stop by the world’s most energy efficient Arby’s, at 1751 Howell Mill Road. The company has cut energy use by 38 percent at its Howell Mill restaurant in Atlanta, a significant achievement, the Department says. The company has made the improvements as part of the Better Buildings Challenge, an initiative tied to President Barack Obama’s Climate Action Plan. Renovations at the Howell Mill Arby’s cost about 80,000 dollars, and include installing LED lighting, low-oil fryers, high efficiency HVAC retrofits, and high-tech remote monitoring systems. “Arby’s has a great story to tell,” Dr. Kathleen Hogan of the Department of Energy said during a tour of the facility. Company-owned Arby’s restaurants have reduced their energy intensity – a measure of energy efficiency – by 17 percent, with a goal of achieving a 20 percent reduction by 2020. According to Dr. Hogan, taking measures to increase energy efficiency is the “fastest, cheapest,” way to decrease energy usage, citing possible savings amounting to 80 billion per year across all commercial and industrial organizations in the U.S. The food service industry accounts for four percent of all commercial building space, but ten percent of commercial energy use. The Better Buildings Challenge is a voluntary program run by the U.S. Department of Energy, with a goal of achieving at least a twenty percent increase in energy efficiency of commercial buildings, industrial plants, and multifamily housing over a ten year period. “Working with the Better Buildings Challenge has been an important extension of our Efficiency Matters program, inspiring us to increase our goal to 20 percent energy reduction by 2020,” Paul Brown, Chief Executive Officer of Arby’s, said in a press release. The Better Buildings Challenge currently has over 250 organizations participating in their programs.